From Chillout to Dubstep, Trance or Deep House, this inspirating pack gives you as much flexibility as possible to fit any kind of production. MIDI files allow you to switch any progression in a different key and assign these melodic phrases to your favorite synth or sampler to slot perfectly into your next production at any tempo. Import your chosen file into your sequencer software, and you’re then free to get creative with variations and re-arrange the musical phrases exactly as you want it, add your own unique sound or fx and build up your new track ! We also added expertly prepared, unique sounding textures in WAV as a bonus to work seamlessly with all major software : From rich sounding chords to dark filtered ambiances or emotional piano progressions, there’s something for everyone ! Browse through, and fuel your imagination. All WAV loops have been created with state of the art sound design techniques, processed with high end plugins, looped carefully and are clearly labelled by tempo and musical key for ease. Provided from 100 to 140bpm in super-high fidelity 24 bit format, they will perfectly match with the MIDI files and be a great addition to your new production. You can expect to find 540MB of original material containing 40 MIDI files and 160 stunning WAV loops featuring 4 to 12 bars phrases with variations of textures sorted in 8 groups: All loops featured in the demo are included in the pack as well. Finally you’ll find 5 different presets for NI Massive as a bonus to fire up in your project and start producing ! 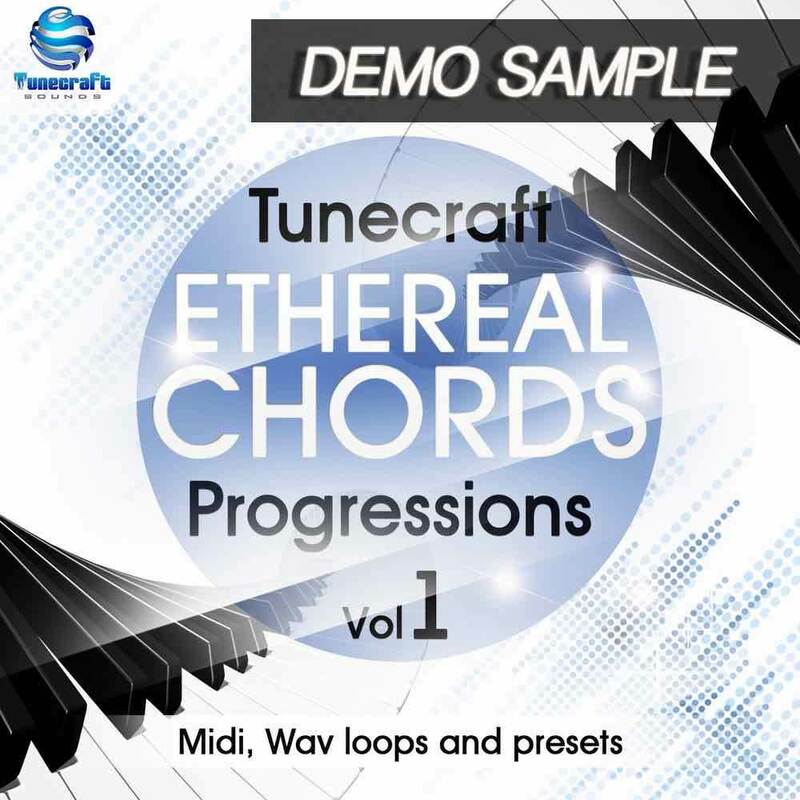 Tunecraft Ethereal Chords Progressions can be used in a wide range of EDM as well as Ambient, Chill-out, Cinematic, Film Score, Background Music, Classical and whatever style you are into. This is a must-have for producers of any genre so get ready to maximise your midrange, and lift your tracks through the roof. Please note that this pack does NOT include the drum loops featured in the demo.